The main opposition party announced Thursday that it had excluded five incumbent lawmakers from its nominations, accelerating efforts to reinvigorate the party and reach out to moderates ahead of the April general election. Reps. Jung Chung-rae, Yoon Hu-duk, Kang Dong-won, Boo Jwa-hyun and Choi Kyu-sung were barred from running in their constituencies as The Minjoo Party of Korea decided to send out “more competitive” candidates on the campaign trail. The party said the excluded representatives have all suffered political scandals and low popularity or poor performance. The second-term lawmaker Jung has yet to file a complaint against the decision, but the third-term lawmaker Choi and the first-termer Boo refused to accept the call. “There was a serious debate about candidates such as Jung,” said Hong Chang-sun, a former lawmaker who oversees the party’s nomination procedure. The outspoken lawmaker was disciplined last year by the party’s ethics committee for comments he made against a fellow lawmaker. Yoon has faced allegations that he had pulled strings to get his children jobs at a conglomerate. Kang was responsible for a political backlash last year after claiming the Saenuri Party had manipulated the 2012 presidential election. The announcement, which came after the party’s first shake-up on Feb. 24, drew mixed reactions from within and outside the main opposition party. Supporters of Rep. Jung Chung-rae hold protest against The Minjoo Party’s decision to exclude him from its nomination list, Thursday. Yonhap. Some Minjoo Party hard-liners and party officials opposed the decision to side with Jung, who most recently garnered positive reviews for his tearful participation at the party’s nine-day filibuster against the government’s antiterrorism act. Rep. Kim Kwang-jin said through his Facebook account that the party should embrace Jung, comparing him to “a courageous advocate” of the party. 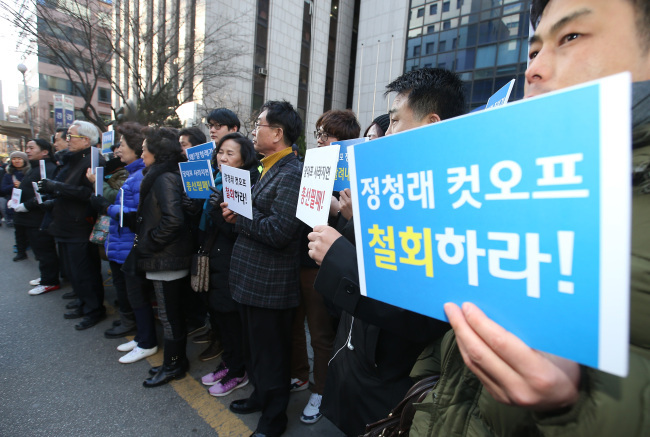 Rep. Jin Sung-joon and Son Hye-won, the party’s chief publicist, also urged the leadership to withdraw the decision. Jung’s supporters joined the fray. His online advocates temporarily shut down the Minjoo Party’s website in protest against the decision and filled social media channels with messages critical of the leadership. “Excluding Jung is a crazy thing to do,” an anonymous commenter said on the Minjoo Party website. Observers noted that the debate over Jung reflects the new leadership of the party’s interim leader Kim Jong-in -- shifting from ideological confrontations toward the debate over the Park Geun-hye administration’s economic policies. “It would serve as a litmus test,” said Yoon Tae-gon, a senior political analyst at Moa Agenda Strategy. “I think the party concluded that keeping Jung in the party runs counter to its new leader Kim Jong-in’s steering of the party,” said Yoon. The People’s Party, meanwhile, dismissed the decision to exclude Jung as an “insincere gesture” and accused the main opposition of lacking the commitment to overhaul the party system the new party believes has been dominated by factions close to former president Roh Moo-hyun. “They have failed to remove more hawkish members inside the pro-Roh faction,” said Rep. Moon Byung-ho. The People’s Party said the main opposition’s left-wing heavyweights, such as Rep. Lee Hae-chan and Lee Mok-hee, should be excluded from the nomination list.